The midway point in the United Soccer League season has come and gone, so where exactly does Bethlehem Steel stand? Well, in the most literal sense, they occupy 11th place in the USL’s Eastern Conference. Three positions off the final playoff spot does not sound the most attractive place to be nineteen games into a season, but they’re a mere three points back of Charlotte Independence for eighth place and only five from fourth place Louisville City. Eleventh place is exactly where Bethlehem Steel deserve to be. It has been a season plagued by continued ups and downs for Brendan Burke’s side—a glimpse of hope here, a dash of disappointment there. 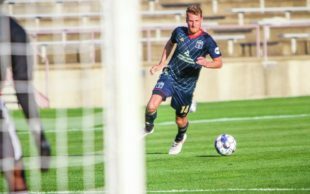 The Steel have been unable to gather any form of momentum throughout the season, as they have only one multi-game win streak on the year, which came back in the middle of May after a 3-0 dismantling of New York Red Bulls II at home and a narrow road victory at Indy Eleven. Still, through all of this inconsistency, the Steel haven’t exactly been bad either. Only twice have they lost back-to-back matches this season, once at the very beginning of the season and once during their most recent road trip to Atlanta United II and in-state foe Penn F.C. Bethlehem were able to limit the damage by squeaking out a draw against North Carolina in their return home this past weekend. Goodman Stadium has been, for whatever reason, a fortress of sorts for this 2018 Steel team, having not lost a single match. With just seven of the last 15 matches being played at Goodman, the Steel will have to continue riding this club-record eight match unbeaten streak at home. The head coaching position is where the Steel set themselves apart. It’s a talented squad, but Brendan Burke still has obstacles to overcome. Less preparation time, lineup changes, budget restrictions are just some of the obstacles a head coach in the USL has to face on a weekly basis. Brendan Burke is thriving in those conditions. Burke is proving that he can grind out results against the elite of USL amid the challenges. Two draws against a very strong, MLS-bound F.C. Cincinnati team, a draw at home with reigning USL Champions Louisville City, and an absolutely dominate performance against NY Red Bull’s highly respected affiliate team and Steel rivals, NYRB II. These names are no joke to those who follow second division soccer here in America. Points against them matter. These are teams riddled with MLS-level talent and fan support—two things Bethlehem lacks, quite frankly. More than 75 games into Burke’s tenure at the helm, we can really see a true style of play taking shape in Bethlehem’s system. He has taken this team and made it his own with a desire to field a team of youthful, energetic players—each with the focus of using that energy to create a high pressing, attacking minded team. A system much like that of New York Red Bulls and their renown academies. Burke has often times referred to that iconic style as somewhat of a “template” for how he tries to coach this Steel team. A lot of credit is due for the thirty-five year old gaffer. Burke has minimal options with his lineups thanks to the complex nature of leading an affiliate team, so the fact that Steel are well within the playoff hunt is a testament to his style and leadership abilities. Much like their parent club, Bethlehem Steel have a problem at the striker position. Last year, B.S.F.C. had the luxury of utilizing the exploits of Union striker Cory Burke as he found his form. Now, Burke is red hot and looks to have surpassed C.J. Sapong as the club’s main marksman. With Burke out of the picture, Steel turned to their newest signing in March; Brandon Allen. Allen, a large, physically imposing striker seemed perfect on paper for Steel. Someone who could hold up play and distribute the ball. Allen bagged himself a few goals, but never fully contributed to the starting XI and found himself a new deal with Nashville S.C.
Academy boy Tonny Temple and MLS SuperDraft pick Adian Apodaca have gotten their minutes, but in the 10 Steel games I’ve watched this year I’m not sure I’ve seen either log a shot on goal. In recent weeks Brendan Burke has assigned Fabian Herbers to the role of the no. 9 position. To the delight of many, including the German himself, he has impressed up top. Is it the best option in the current climate? Yes. Is it a permanent solution to Steel’s goal scoring woes? No. Most recently, the Steel signed Cameroonian striker Faris, and the club hopes that he will make an immediate impact on the pitch. For most of the squad, it’s been same old same old. Steel fans usually know what to expect out of most guys at this point. We know that James Chambers is a brute force in the middle of the field and a leader by nature. Santi Moar is, in a word, inconsistent. Sometimes the most outstanding player on the pitch and sometimes he’s just not. Matt Mahoney—Bethlehem’s iron man. The kid plays more minutes than anyone and is the model of consistency for a central defender. Most can agree that the Allen signing was a bust, but several newcomers have left their mark on the organization. Particularly, Michee Ngalina, the 18 year old winger from Democratic Republic of Congo. Ngalina is a standout amongst a wave of African talent sweeping the Union organization. The rapid growth and maturity of such an unrefined player has caught the eye of the Union coaching staff and, per our Tim Jones, has found himself training with the first team on a regular basis now. Seeing that Jim Curtin and the Union have no immediate need for him, look for Ngalina to continue to make an impact for Steel down the stretch. Nice recap, Rob. Just read through it as the Steel game starts at NYRBII. “Disappointing” is the right word to describe the season so far. I don’t necessarily agree however that they deserve to be 11th. Because they’ve been disappointing, yes, they should be 11th. But I think they are a better team than 11th and could definitely be up near 4-5 if they didn’t have so many flat performances over the last month and a half. The one thing I’d add for people who don’t follow BSFC is that since May the lineup has been fairly consistent for the first time in club history. At least much, much more consistent than in the previous 2 seasons. You can somewhat safely predict at least 8 starters every game. I think the increased chemistry has helped, but not as much as I would have hoped. This next week is huge. At NYRBII right now and then home against Indy and Atlanta 2. I’d love to see 9 points. 6 points is a must. Do that and we’ll be right back in it.